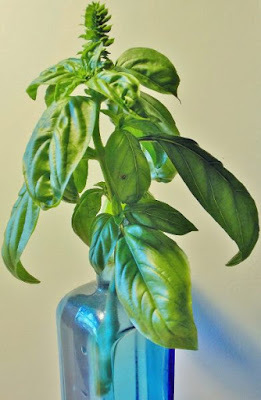 Our basil crop has been outstanding this year. Lots of spaghetti sauce, pesto and bruschetta will be made. 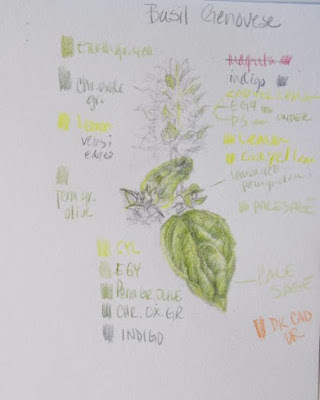 But before it is all gone I wanted to at least get started with a sketch or two to finally begin my series of herb drawings. I had decided to not do as many art shows this year and concentrate on making art for a change. It feels so good to be back in the studio again! The flowers and plants come and go so quickly this time of year. So, I am trying to take lots of reference photos and make quick color studies, as I've done here with the basil, so that I will be able to work on them when the activities of summer have passed and life begins to settle down. Chives, borage, sage, parsley and rosemary are also in my mind to add to this series. I'm hoping for a productive fall and winter art-wise this year. If that's not a gorgeous painting at the top then it's a gorgeous photo. I'm glad you hope to make more art and stress less about shows. You're gonna have fun! By the way, I don't paint any more. I make dolls! And I just finished my herbal lady. Cheryl Miller is a life-long resident of NE Ohio. Having had an appreciation for drawing, detail and the natural world early on, she began her career as an artist in the early 1980’s when approached by a family friend to render a local historic building in graphite. From that beginning she produced a series of limited edition reproductions of other historic buildings in Millersburg, OH. Always possessing a fascination with detail, much of her recent work has concentrated on botanical subjects which are drawn in colored pencil. The inspiration for this art form is found nearby as she is an avid gardener and explorer of the natural world around her home. At the other end of the artistic scale she loves to paint the local landscape as well as scenes from different regions of the US that capture her creative heart. The Marblehead Peninsula and Catawba Island on Lake Erie are favorite subjects. For these she also uses the medium of soft pastel. Painting in acrylics is another medium she is exploring. Cheryl has illustrated two books for children and one cookbook. Her pencil and pastel originals are available for sale as well as fine art giclee prints.